Author of Citizen: An American Lyric, Claudia Rankine, will join Marc Steiner, host of the podcast The Marc Steiner Show, for a conversation about her work. 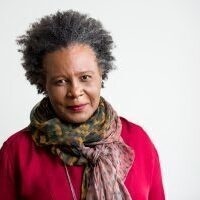 Claudia Rankine is the author of five collections of poetry including Citizen: An American Lyric and Don’t Let Me Be Lonely; two plays including Provenance of Beauty: A South Bronx Travelogue; numerous video collaborations, and is the editor of several anthologies including The Racial Imaginary: Writers on Race in the Life of the Mind. For her book Citizen, Rankine won both the PEN Open Book Award and the PEN Literary Award, the NAACP Award, and the National Book Critics Circle Award for Poetry (Citizen was the first book ever to be named a finalist in both the poetry and criticism categories); and was a finalist for the National Book Award. The reading and interview will be followed by a reception and book signing. Join book discussions at your neighborhood Pratt Library branch.